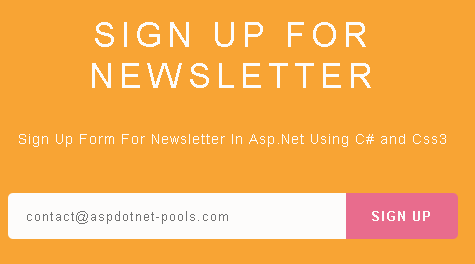 This article will show you how you can create a news letter subscription for your website using css, asp.net in your asp.net application. Some of my previous articles are as follows: Stylish Button Using Css3 In Asp.net, How to Get Mouse Pointer Cordinate Inside a Div Using jQuery In Asp.Net, Get User Detail Like City,County,Region,Zip Code Using IP Address In Asp.Net, Facebook Style Lightbox jQuery Plugin To Display Images Like Facebook In Asp.Net, Webcam Integration Using jQuery Webcam Plugin In Asp.Net, Asp.Net Dynamic jQuery Photo Gallery Plugin With Zoom Effect Using Css, Magnifying Glass Effect Of Image Using jQuery in MVC. So for this article firsat we will create a new asp.net application and add the below code in your asp.net application. 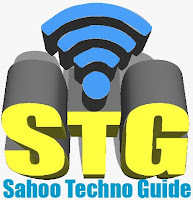 <asp:Button ID="submit" runat="server" Text="SIGN UP" CssClass="button"
In above code I have added the css style sheet to display the stylish form to add email id. Now check he below code to save the data in DB. In above query Sucscription is a table in which we will save the data. Now we have done. Run the application to check the output. Please, please parameterize your inserts. Implementing as shown above will make you susceptible to SQL injection.